The 250-122P from Sioux Chief is a Turbovent Air Admittance Valve. It's designed to control the input to the drainage, waste, and vent system without allowing harmful sewer gases to foul a building's living area. TurboVent Air Admittance valve is sized to accommodate common drainage fixture unit (DFU) requirements, each unit comes with an adapter, which allows to be used in various installations, branch venting applications or stack venting applications. The TurboVent is the best way to save costly labor and yards of material without sacrificing to the drain, waste, venting of the plumbing system. 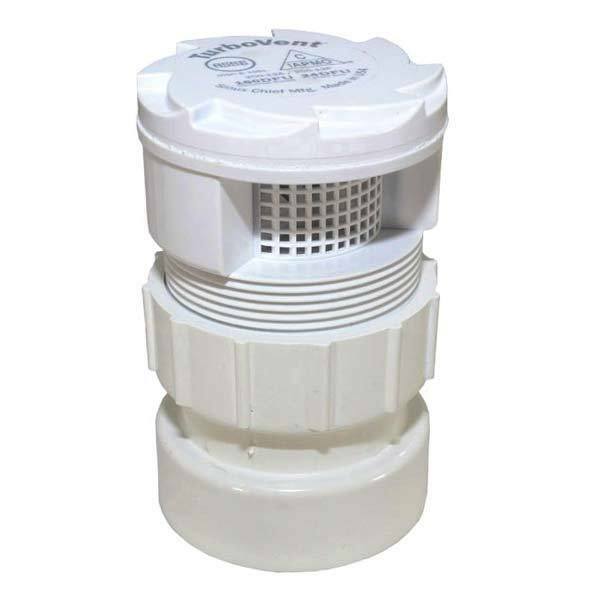 The TurboVent Air Admittance Valve 250-122PB should be installed in an area with adequate ventilation in an accessible location which will provide easy inspection and maintanance. TurboVent air admittance Valve is certified by ASSE to 1050 & 1051. Listed by IAPMO, adapters conform to ASTM D2661/D2665. Conforms to International plumbing Code (IPC) 2009, to International Residential Code (IRC) 2009, to Uniform Plumbing Code (UPC) 2009 section 301.2. Have sealing membrane and actuating device within unit spin with each activation. Materials: ABS housing/thread body, ABS actuating device, elastomer sealing membrane.